Irrigation is a key strategy for food security and poverty alleviation among small farmers in Tanzania. However, the potential of irrigation to improve food security is limited by multiple barriers. 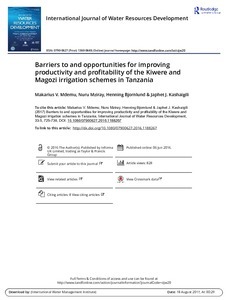 This article discusses these barriers within the Kiwere and Magozi schemes. Results indicate that water supply barriers are caused by poor irrigation infrastructure and management. Lack of finance is also a critical barrier to increasing overall productivity. Finance affects farmers’ timely access to adequate supply of quality inputs and machinery and availability of transport to access inputs and profitable markets. There is evidence that these barriers have to be addressed holistically.